Grass Beyond the Mountains by Richmond P. Hobson Jr. - originally published in 1951, but reprinted in 2007, this book was the inspiration for the CBC TV series “Nothing Too Good For a Cowboy”. A memoir of Canadian frontier life in the 1930s. 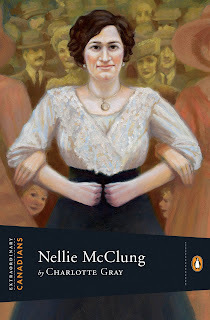 Nellie McClung by Charlotte Gray - new in the Extraordinary Canadians series from Penguin Books, a biography of the important activist for women’s writes by a current and well respected historian. Searching for Schindler by Thomas Keneally - memoir by the author of Schindler’s List about how he came to write the Man Booker Prize winning novel and the his experiences with the Oscar winning film adaptation. Gluttony by Francine Prose - Oxford University Press and the New York Public Library’s cleverSeven Deadly Sins series sees popular and prominent writers penning their thoughts on Pride, Envy, Lust, Sloth, Anger, Gluttony, and Greed. Thought-provoking, often witty and never very long.